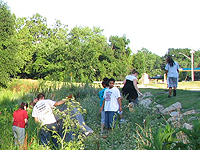 The City of Independence has volunteer opportunities in several of its departments. All of these volunteer opportunities offer citizens the chance to give back to the community while assisting City employees. For more information, contact Marissa Willis (816) 325-7388. Assist the Emergency Preparedness Manager and Fire Department Explorers program with office duties. Answer phones, groom animals, clean cages, feed and exercise animals, fundraising events and education outreach programs. Volunteer opportunities at City’s historic sites: Vaile Mansion, Bingham-Waggoner Estate, National Frontier Trails Museum, 1827 Log Courthouse,1859 Jail & Marshal's Home Museum, Pioneer Spring Cabin, Chicago and Alton Depot. Volunteers in Police Services: Assist with patrolling parking lots, Santa-Cali-Gon Fair; booth at Independence Center, Child ID program, park and trail surveillance, parking enforcement and directing traffic. Assist Palmer Center staff with daily meal program for seniors and package meals for home delivery. Volunteer weather spotters, R.A.C.E.S ham radio operators, Adopt-A-Siren, Community Emergency Response Team, and Emergency Operation Center. Tree sales, Arbor Day activities, City-wide Clean-up, Truman Walking Trail, and Master Gardeners. Adopt a one-half mile stretch of City street for litter control. 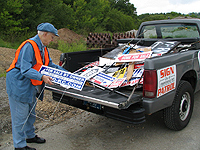 Remove signs illegally placed in street right-of-way. Adopting a park will help to extend your tax dollars by allowing City parks employees to spend more time on major renovations, repairs and other much needed maintenance work. Assist with special events and programs at all parks and with general office duties.